France's law enforcement and prison system have been sharply criticised by Europe's human rights watchdog. The Council of Europe found prisons were overcrowded and police operated with a sense of impunity, according to excerpts from a report due next week. The council's human rights commissioner Alvaro Gil-Robles said there was a "widening gap" between the "text of law and what is actually practiced". 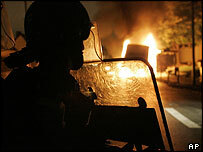 The report comes months after many French cities were rocked by riots. The report makes 50 recommendations to improve France's record. They include faster and more effective access to legal assistance for detainees, separating convicts and people awaiting trial and shortening the maximum allowed 45-day solitary confinement. Details of the report were leaked to Le Parisien newspaper, and confirmed by Mr Gil-Robles. The findings are based on Mr Gil-Robles inspection of seven prisons and five police precincts last September. He said France "has a relatively complete legal arsenal offering a high level of human rights protection" but "does not always give itself sufficient means to put it into application". He found prisons were overcrowded and dirty, jail cells in police stations were in a terrible state and the justice system was too slow. He criticised the treatment of minors in prisons and warned that a "hardening of immigration policies... risks violating the rights of genuine asylum seekers". He said there was a weak reaction to anti-Semitic and racist crimes and called on France to fight against all forms of police brutality and violence. "What is most important for me is that the penitentiary system is not a system of vengeance but a system of justice - for punishing criminals and, afterwards, permitting them to reintegrate into society," Mr Gil-Robles told France-Info radio. "Today, this is not possible given the current state" of the French system. The Council of Europe is intended as the guardian of human rights, democracy and the rule of law in all its 46-member states.